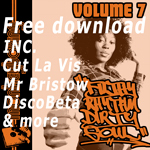 If you’re already known for releasing funk, soul and hip-hop whither next if you’re looking to expand generically? Why – reggae of course! 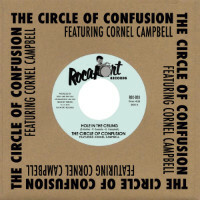 Step forward Rocafort Records with their first drop of the new year featuring Swiss production team (not to mention certified reggae addicts) The Circle Of Confusion along with Jamaican vocal legend Cornell Campbell. Hole In The Ceiling is the rootsy seventies style consequence of the Lausanne-based duo summoning the courage to contact their favourite veteran reggae singer and discovering that, yes, he certainly was up for doing a cut with them. So what you singing about Cornell? “I’ve got an awful feeling on my mind/ Babylon got a hole in the ceiling/ That them a hide…We can’t take no more of this system/ Too much people are crying.” Well, quite. And what better format to propagate such a righteous message upon to the masses than vinyl seven inch with the dub on the flip. That’s right. Coming to a vintage dub sound system near you this summer (Negus Melody Sound System – big up!) though out considerably sooner!